We have been making progress as a whole, both in the close reading essay and the search and comparison of the ad texts using digital tools. Initial searches of the Arkansas ads did not yield huge amounts of information, but enough to demonstrate that Voyant as a tool can help answer questions about the data. 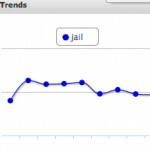 Some of the use for Voyant can simply be demonstrating a lack of a strong trend on a certain topic. The first question I used Voyant to answer was whether or not Texas slaves appeared to be receiving greater abuses or punishments than those in Arkansas. This required a search for vocabulary sets related to this. The close reading revealed that “scar”, “disfigure” and “lame” were used to describe slaves who seemed to have suffered injuries. While there are many specifically listed injuries, those are the most frequently used. By searching these words in all the sets of ads, I was able to reveal that Arkansas seemed to have proportionally more references to scars than Texas. In our previous readings, we had talked about how slaves could have been more likely to have carried guns in dangerous Texas locations. Searching the text for references to armed runaways carrying rifles, shotguns, or knives, I found the results to indicate that there were proportionally less references to guns in Texas than in Arkansas. Searching for references to Mexico and Mexicans, I found nothing in the Arkansas ads referencing Mexico. It does seem to be a Texas-specific location so far in terms of a destination for runaways. There were proportionately more references to horses and mares in the Texas ads. This could tie into the sheer size of Texas for escaping across, a higher likelihood of property owners having horses, or perhaps that the acquisition of horses was necessary to try to make it all the way to Mexico. From the first search through the ads, there were a few specific improvements I had in mind for future searches. One is to make a simpler way to compare numbers in data sets of different sizes. I was using rough proportions to compare the quantities of occurrences, but somehow finding specific sets within the States that were the same size would make a more straightforward process. Another issue is the inclusion of jailor’s ads. For references to weapons and means of transportation, these will not be included as frequently in the ads of those already captured. Thus, different proportions of included jailors ads in the sets will further skew results. 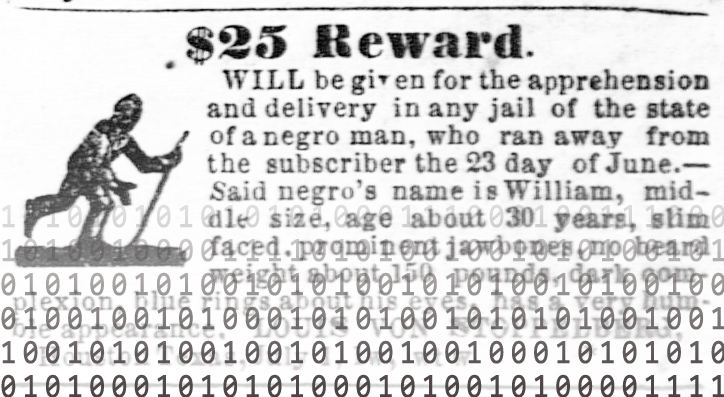 Future searches include terms describing the intelligence of slaves and descriptions of their skilled labor, to be compared to negative terms, as well as searches for references to accomplices, thieves, or others who might have persuaded or forced slaves to escape. Our task is to compare the Texas ads to those from Arkansas and Mississippi . We will be utilizing a range of tools for this, many of which we have touched on in class. We are looking at our work as a series of progressive tasks mining the ad content for deeper trends and information. Our first task is to complete a close reading of the ads in question. This will familiarize us with the material and provide grounds for categorizing key concepts, words, and phrases that we should search for. By Wednesday, April 2nd, Alyssa will have done a close reading of the Austin Gazette ads and Daniel will have read the Texas Register ads from the overlapping years. This will give a starting point of keywords and concepts we’re looking at to start the write up. By April 7th, Daniel will have begun the text analysis of Texas and Arkansas ads with digital tools and the findings of the close readings. He will share these with Alyssa, who will work on the close reading write-up due that day. Our second task will then consist of utilizing these keywords and concepts to search the text with Voyant and TF-IDF. We can look for trends and differences across states in the various results and visualizations we get from these. We can also verify some of the categories by running the text through topic modeling, and searching those results for trends in Voyant as well. Our future progress reports will include a commentary on how well these tools have worked for various purposes, for the benefit of future studies using these tools. From this point, we plan to be flexible based on the findings of the text analysis. Specific results might encourage further mining of the text for trends, or else might require us to go back to some of our earlier readings for comparison or contrast of findings. 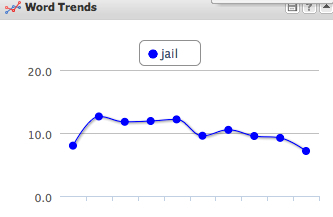 We can also at this point see if filtering the jailors’ ads from the text will change the language trends of the ads significantly, or if in fact the language of the different types of ads are highly similar. 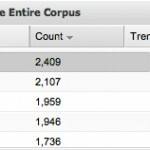 I’ve been using the site Voyant Tools to look at the text content of runaway ads. In a nutshell, the site pulls all the words, and finds their frequencies and trends. 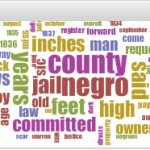 It displays them in a variety of ways, which I’ll show with its analysis of 550 pages of Mississippi slave ads. Without screenshots, you can view the results through this link (one feature is the enabled url and unique ID for data sets, which allows re-linking and comparing between documents). 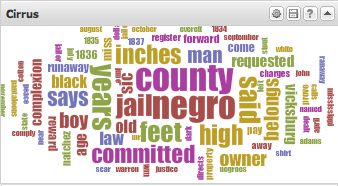 Features include Cirrus- a basic word cloud, numerical data for the appearances of words in the corpus, the option to see each appearance in context, and Trends- a tool that visually maps out the relative frequency of the word throughout the course of the document. This last tool is the most interesting to me, as in chronologically ordered ad sets, it gives you an immediate look at the relative usage of the term over time. For example, the use of 1836 has one remarkable spike in usage over the course of several decades… We can use this to track usage of racial descriptive terms over time, or similar word-based information. Through the incorporation of numerous corpuses of information, we can also compare word usage in different states and areas. I can see how this will be helpful in the future in answering some of our questions regarding how Texas runaways and situations were different from those in the rest of the south.